Martin’s father bought him his first bike at the age of five and within a year he was riding Youth Motocross. Following this he competed in many youth competitions from 1996 to 2003, including the Schoolboy MX and World Endurance Championship Juniors, where he placed 13th in 2003. Jessopp’s career started very much on the track, racing in the British Superstock Championship in 2004 and the British Supersport Championship the following three seasons, finishing 11th overall in 2007. He has competed in the British Superbike Championship every year since 2008 with the exception of 2012 when he contested the World Supersport Championship. In 2008 and 2009, Martin raced in the British Superbike Cup, where he finished 2nd and 3rd respectively. These impressive performances saw Jessopp take to the British Superbike Championship in 2010 to finish 17th and 2011 where he placed 11th. Jessopp’s consistent form in the Macau GP can be seen as a great achievement. He first competed at the event in 2007, finishing 19th, returning in 2010 where he was forced to retire but in 2011 he made a real impression, finishing runner-up to Michael Rutter. This was also the way the race finished in the following year, giving Martin two successive podium finishes. Seventh in 2013, Martin was back on the podium at the Macau GP, with two 3rd place finishes (2014 and 2016) and coming runner-up in 2015, this time to Peter Hickman. This takes Jessopp’s Macau podium count to an impressive five, showing just how consistent and talented he is. His best year in the British Superbike Championship came in 2011 when he finished 11th overall with a best finish of fourth at Donington Park. After a year abroad in the World Superbike Championship he returned to the BSB series in 2013, finishing 27th overall with 12 points. He has competed every year since, placing no higher than 21st, which came in 2017 where he accumulated 22 points. After getting so close so many times to the Macau GP topspot, Martin’s first International Road Race win came in the North West 200. This win came in the Supersport race in 2017, where he beat Ian Hutchinson by under a second (0.772 secs). Jessopp followed this up with another win on the same day, this time beating Michael Rutter by 0.848 of a second in the Supertwin race. Martin has been competing in the Isle of Man TT since 2014, where his highest finish was 11th in the Lightweight race. He also raced in the Superbike TT where he came 26th and the Superstock TT finishing 27th. Unfortunately, he crashed at Governor’s Bridge in the Senior race, breaking his shoulder. Two more silver replicas followed in 2015, his best finish being 14th in the Senior, and in 2016, Jessopp claimed his first TT podium, finishing 3rd in the Lightweight TT in a race won by Ivan Lintin, with James Hillier in 2nd. 2017 was Martin’s most successful TT to date, where he came runner-up to Michael Rutter in the Lightweight TT and recorded his highest finish in the Senior TT, coming 9th. As well as these, he also competed in the Superbike race, placing 10th and came 12th in both the Supersport TT 1 and Superstock TT. In the Senior race, he broke the 130mph barrier to become one of only 20 riders to achieve the feat in the history of the event. Fine form at the North West 200 saw Jessop win the Super Twins Race 1 with a best lap time of 109.011mph. As well as this, an impressive 4th place in the Superbike race, just beating Conor Cummins over the line, put Martin in good spirits ahead of the Isle of Man TT. Fine form at the North West 200 saw Jessop win the first Supertwins race with a best lap time of 109.011mph whilst he also took an impressive 4th place in the Superbike race, just beating Conor Cummins over the line. 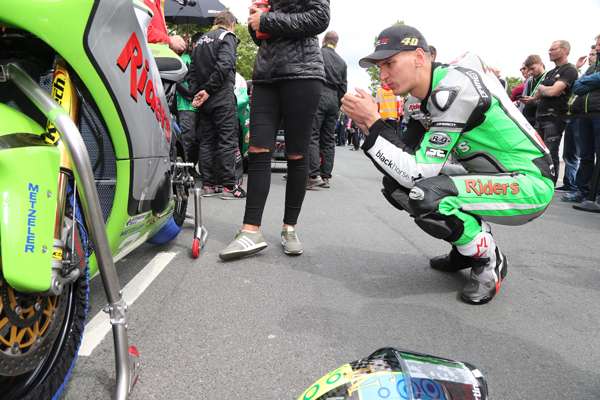 In addition, he claimed sixth in the second Supersport race and seventh in both the Superstock and opening Superbike races to not only complete a successful day at the North West but also put him in good spirits ahead of the Isle of Man TT. 7 seemed to be the luck number for Jessopp at the 2018 Isle of Man TT, with a hat trick of 7th place finishes to his name. These came in the Superbike and Superstock races, as well as the feature Senior race in which he completed the six laps in 01:47:58.408. The Superbike race saw him set a new personal best lap around the Mountain Course with a speed of 130.741mph to become the 16th fastest rider in the event’s history whilst a consistent showing on the island saw Martin take 13th in the Supersport TT 1 and 16th in the Supersport TT 2, riding the 2016 Triumph Daytona 675. Jessopp capped a successful and consistent year on the roads with a yet another podium finish at the Macau GP, placing only behind Peter Hickman and Michael Rutter whilst riding the PBM Ducati. It moved his career total of podiums around the 3.8-mile circuit to six giving him the slightly unenviable record of taking the most podiums at the Macau GP without winning a race. At the end of 2018, Martin announced he would be retiring from the British Superbike Championship and Isle of Man TT but didn’t rule out the possibility of competing at other events in 2019.